"My home is Waterbury, Connecticut. My family is still here, and I still visit frequently." Gary Franks was the first black Republican elected to the U.S. Congress in nearly 60 years when he took office in 1991. Since his political career ended in the late 1990s, he hasn’t been heard from in Connecticut. 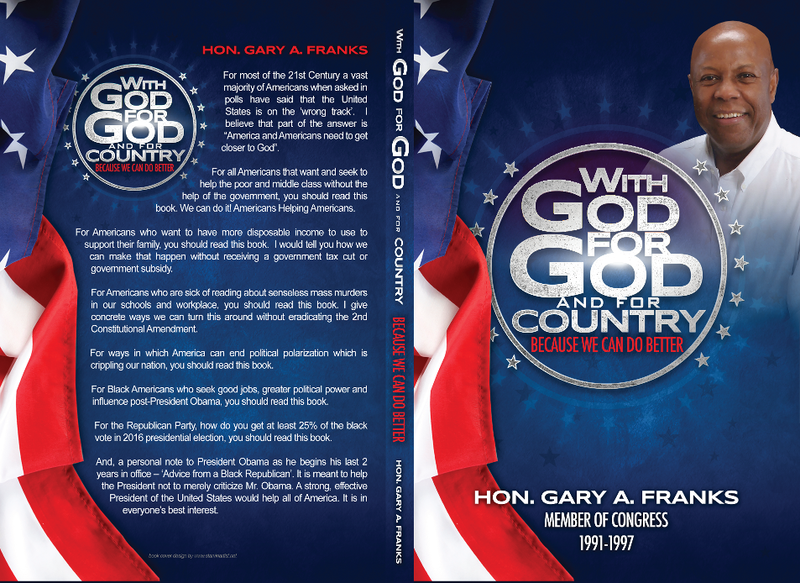 Now Franks has a new book called With God, for God, and for Country: Because We Can Do Better. Franks appeared on WNPR's Where We Live to talk about his views on God and politics. He talked about his plans to get more African Americans involved in the political system -- as Republicans. Below is a partial transcript of host John Dankosky's conversation with Franks. Watch a recent interview with Franks on "Face the State" with Dennis House. Where Has Gary Franks Been? HOST JOHN DANKOSKY: You have a lot of ideas you want to talk about with your new book that’s coming out, but one of the things that I have to ask you is after you left Congress, and after you tried to run for Senate against Christopher Dodd back in the late 1990s, you kind of stepped away from politics, and you kind of stepped away from the state. Where’d you go? GARY FRANKS: Well, most people under the age of 95 -- I think Bob Dole is under that age, and even though Bob Dole is under that age, he is in Washington, as well. Most of us would stay in the Washington, D.C. area to do public policy type work, etc. I became an adjunct professor at Georgetown University; I did that for about ten years. And then I’ve been a professor at Hampton University for about 12 years. So that’s where I’ve been, but my home is Waterbury, Connecticut, and my family is still here, and I still visit frequently. FRANKS: Can I interrupt for a moment? FRANKS: Most of those things are lies. I’ve had the same name all my life. I have lived in my same residence for 12 years. I have visited and have lived in a little place in Florida for a year or so. But I have had a situation, a very unique situation, John. When I was in politics, I had well over a million dollars, maybe multi-million dollars' worth of rental properties. A third of them were burned down during the time in which I was in office -- literally burned down by people who hated my guts. So, John, I have had experiences where literally the Ku Klux Klan has actually attacked my family, instances where the caucus has done things to me. And I have had instances where my sister passed away, and she died in a very mysterious way; we ended up suing that hospital. That hospital has taken it upon itself to retaliate in this manner, working through one or two newspapers to spread these stories that are just so fictitious and so libelous, and so hateful. And so I just pray for them, John. The cover of Gary Franks's upcoming book. "When you look at the slow erosion of saying thank you to God, we shouldn't be at the mall on Thanksgiving Day." FRANKS: When I ran for office, I never dignified any type of attack toward me. Some people may remember when my opponent had animals running across the screen and saying, “Gary Franks is this,” or some people said that, “This person died; because of Gary Franks’s vote, they would’ve been alive.” I never responded to any negative -- any of these attacks. Also, I know that any people who hate that much, I just pray for them, John. I’ve seen them too many times, and I’ve just prayed for them, and wished them well. DANKOSKY: At the top of your web page, it says, “Let’s work together to end the war on God.” What does that mean to you? 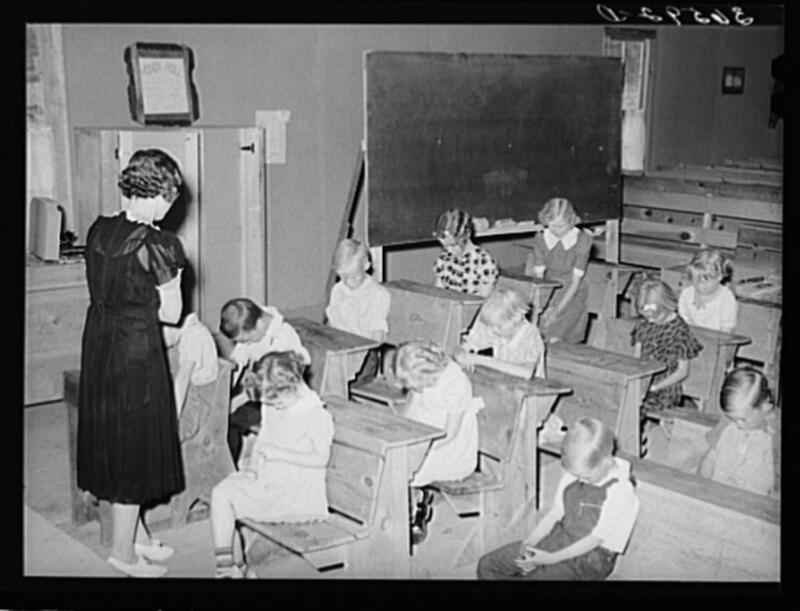 School opens with prayer in a private New Mexico school in 1940. FRANKS: Yes, there’s been a turn-around, John. Going back to the 1960s, when we first started to have a major erosion in this area -- it started with school prayer, then it started with taking away a moment of silence in school. So we’ve had those types of erosions, and I think it has hurt our country. We had the Connecticut Blue Laws, when you didn’t have a lot of commerce being done on a Sunday. During that time, and prior to that time, I should say, you know, we never lost a war. And since that time we’ve seen a major erosion, where -- if you look at even our last two presidents prior to Obama -- where decisions have been made that have led to the detriment of our country. During Bill Clinton’s time, we had the period of the banks going wild, and that almost led to our economic collapse. Obviously, during 9/11 and weapons of mass destruction, or no weapons of mass destruction, we were in a war for 15 years. So I think that even today, even when you look at the slow erosion of saying thank you to God, we shouldn’t be at the mall on Thanksgiving Day. It was never like that before, John. We allowed that day to be a day in which we were to say thank you to God and spend time with God. So that’s very important to me. Politics is too, so hopefully we get to that too. FRANKS: With God, for God, and for Country is coming out probably around the first of the year. And thank you for talking about it. "When the American Indians confronted the Europeans that came over, one followed pagans and one followed one God, who won? There are so many examples." DANKOSKY: Obviously, God and God’s place in your life and in the country is very important to you. I think the question that a lot of people have is: well, okay, maybe we have turned from a traditional Christian God on Sundays, but your God isn’t everyone’s God. FRANKS: No, I’m not saying a Christian God. You said that, John. DANKOSKY: No, I did say that. FRANKS: And once again, the Ten Commandments that Muslims follow; Jewish people follow; and so do Christians, and I’m not looking at just the Christian side of it. I’m looking at the Ten Commandments, and looking at history. When Pharaoh, who worshipped pagans, went up against Moses, what happened? He lost. When the American Indians confronted the Europeans that came over, one followed pagans and one followed one God, who won? There are so many examples. DANKOSKY: Well, a lot of people would call that a genocide, the massive destruction of Native Americans in this country. FRANKS: I’m just saying who won, John. I’m talking about winning and losing. So when you look at situations in which people who follow the Ten Commandments -- and I think we haven’t in the past. I think that we’re slowly eroding, going away from that. I mean, just yesterday, John, there was a problem with a display of a Christian symbol in a school. I think that the establishment clause is there, and the Constitution is there, but obviously, it’s something that I feel very strongly -- that is, the adherence to the Ten Commandments. DANKSOSKY: Let me bring up everything that has happened since Ferguson, Missouri around this time last year. There have been a series of police shootings and other instances in which mostly white police officers have engaged with mostly African American individuals. I think we can all agree that far too many people have ended up dead, far too many people have ended up angry and upset, and feeling as though they are not being properly represented, and not being properly protected. In your plan, what do you do about that, Gary Franks? What can we do better than we have done in this last year regarding police, and the way they interact with African Americans? "Hands up! Don't shoot!" 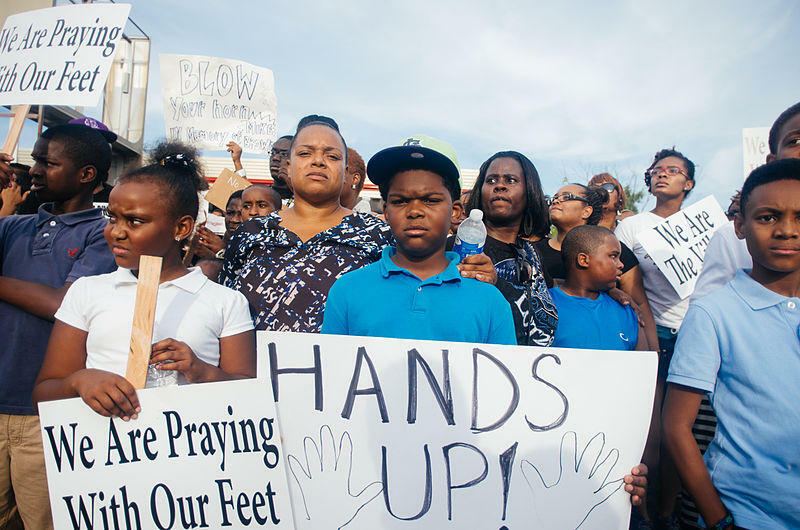 signs displayed at a Ferguson, Missouri police violence protest on August 14, 2014. "We need more jobs in the black community. We need to have a situation where people are not so segregated in certain areas." FRANKS: I can’t answer that question, John. I’m going to take it to another point, because I have this on my blog which is garyfranksblog.wordpress.com, and I talk about what racists are taught. And, really, the theme of it is against Dylann Roof. They’re taught, really -- I mean, you aren’t born a racist; you’re taught to be a racist. Now, how are you taught to be a racist? You’re taught to be a racist when you look at an employee who's next in line for that promotion, and that happens to be a black individual, and everyone knows that this black person should get the job. And then you, as the white person, said, “No, we’re not going to fill the position.” When you have people who don’t intermingle with each other because of certain things that are happening in our society; a polarization in Congress; a polarization in so many places that officers and people react differently when they see someone that’s different from them. Now, I grew up in a very diverse area. I was fortunate enough to go to a great high school, the state champs in Connecticut, that being Sacred Heart High School I was fortunate enough to go to Yale University, a great institution. And I was in diverse environments; I worked for three Fortune 500 companies for ten years. But John, I know that there’s racism. I saw racism when I was nine years old; ten years old. I had a cross burning in front of my yard when I was a youngster. I had a dead possum placed in my mailbox when I was a youngster. And I went out there, and I pulled that dead possum out of that mailbox dripping in blood. Fast forward: when I was a sitting congressman, I went to a certain town in my district. And I looked and I saw people draped in a white uniform with things on their heads. I had my chief of staff go over to the organizer of that parade and say that I’m not marching in this parade if they are marching in this parade. And the organizer of that parade -- I’m a congressman in the 90s -- walked over to me and said, “I guess you’re not walking in the parade.” I’m a U.S. Congressman: first black Republican in 60 years; first black House of Representative member in all of New England, in the history of the region. So my point is: we want to rid ourselves of racism wherever we can. And to answer the question about the police officers, my only response to that is that people are not intermingling as much as they should, and then they have a better understanding and appreciation for each other. Community policing has worked so well for other communities. "The bottom line is: many African Americans -- they're swimmers, and they're drowning." DANKOSKY: But part of what you’re saying is that blacks in America need to have greater political participation. One of the issues we hear over and over again is that it’s hard to feel as though you’re empowered to take part in politics if you are being judged by the people who are supposed to protect you differently than other people are being judged. If your neighborhoods are being policed differently -- if cops are looking for the types of low-level activity in your neighborhood that they wouldn’t be looking for in the suburbs -- you begin, over time, to think, my goodness, there’s nothing I can do. That’s a lack of power right there, and doesn’t that have to start somewhere, in terms of the way we work with police to not view African American communities like that? FRANKS: John, we need more jobs in the black community. We need to have a situation where people are not so segregated in certain areas. The bottom line is: many African Americans -- they’re swimmers, and they’re drowning. The first thing that anyone should say when they see a person drowning is -- what? Help them. And that’s what the black community needs immediately. I wish the president would do that immediately. DANKOSKY: What does the help look like? Because the Democrats have one version of help, so talk about it. DANKOSKY: Give me just a hint, because this is one of the most important issues that we’re talking about. Essentially, what Republicans say almost across the board is that the Democrats hand you something, and that’s the problem with Democrats. We want you to be empowered, to work yourself, to do something for yourself, right? You’re talking about helping the black community. So then, what do we do? FRANKS: John, as I said before, I am going to refrain from answering that. I do have some answers in my book; however, the think tank is going to work on these ideas. We are going to work with other think tanks to also sit down and talk with politicians. I know that dialogue is important. When we worked on the welfare reform bill, we heard from a number of think tanks, and got input from other folks, before it was fine-tuned. And that’s what I intend to do with this. Zachary LaSala contributed to this post. When Senator Richard Blumenthal announced that he would support the deal struck between the Obama administration and Iran over that country’s nuclear program, it all but assured that the plan would go through without congressional obstacles.